Did you know about these? I didn't . . . I had never, ever heard of them before last week. While lunching with friends George and Pedro at their home, they brought these little discs of crunchy goodness to the table. I ate one and of course responded with an exuberant "WHAT IS THIS?" And they excitedly shared that these are tostones otherwise known as fried plantains. Of course, next came "How do you make them?" They looked at each other with some trepidation and George quietly said, "You slice and fry them (insert long pause here) . . . twice."WHAT?!! You fry them TWICE? So then I got the rest of the story. These are commonly served with most meals at any Dominican table. For lunch you would traditionally have rice and beans with tostones. Of course, I patiently explained how unhealthy any food is, that is double fried. And I promised to work on a healthier version for them. I realize that this is probably a high ranking comfort food AS IS, but I really wanted to try a remake. I was also excited to share it with my family. Plantains look A LOT like a banana. But they are definitely different. 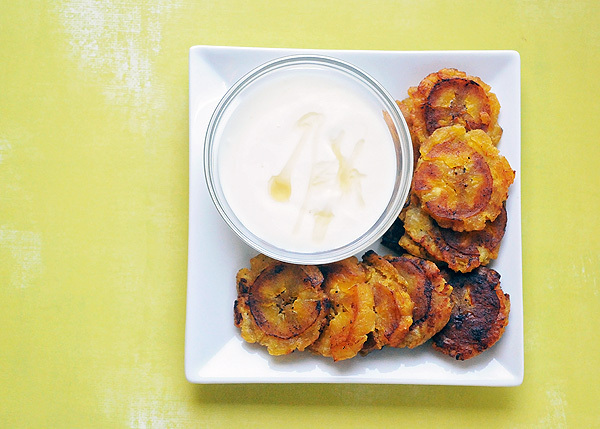 You need green plantains to make tostones. They have less sugar than a banana. But are sweeter than a potato. Let's put them halfway between the two. These are not breaded, but instead crisp up due to the high starch content. Ok, these have to be fried . . . twice. To get the right crispiness, you just have to. No way around it. But I swapped the vegetable oil for coconut oil. This is a big deal. I also added some additional flavors to these little bites of crispiness. Specifically garlic and lime juice to replicate common cultural flavor. I started by peeling the plantains. The peel is more woody than a banana. First I cut each end off and then cut them in half. From there, I scored a line down each side and removed the peel. I sliced them about 3/4 of an inch thick. Next I prepared a marinade of garlic, garlic juice, lime juice and olive oil. I put the slices and marinade into a bag and began preparing the pan. I coated the bottom of the pan with coconut oil and heated it. Fry the slices, flipping when they begin to brown. It only takes a few minutes. When done, I placed on a paper towel. One by one, I used the bottom of a can of vegetables to smash each slice. Now I placed the smashed slices back into the bag of marinade to pick up a little more flavor. Add another tablespoon of oil if needed to the pan and heat again. Add the smashed slices back and cook until brown and crisp. They cook up quickly, only a few minutes per side. Again remove to a paper towel. Now I created a simple yogurt and honey sauce with a dash of garlic salt. Trust me, it works. The tangy dipping sauce helps insure these are a healthy treat.